We’re headed for the weekend here in Wisconsin and we officially reached 28 degrees (farenheit) as a high temperatures today! Spring is certainly in the air. Of course, Opening Day comes after the season of winter finally gives way to spring. 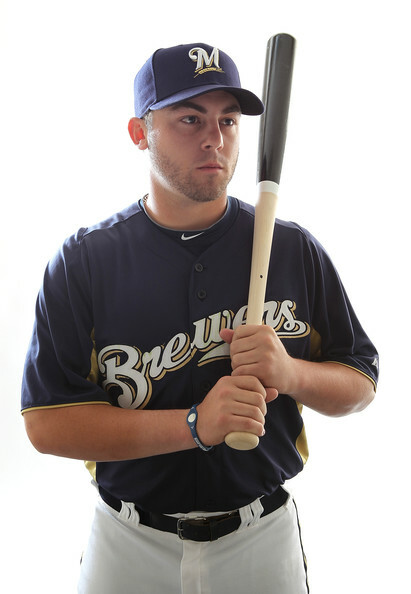 And counting down to Opening Day is what “Brewers By the (Jersey) Numbers” is all about. Today is Thursday, February 13th and we are 46 days shy of that first pitch of the regular season. As for 2013, Burgos entered the year as a new 40-man rosteree and headed to his first big league camp. His time in camp was shortened considerably by his participation in the World Baseball Classic on behalf of Team Puerto Rico, however. Burgos was masterful pitching for his home team. In three relief appearances, Burgos went 1-0 with a 0.69 ERA and held opponents down with a 1.23 WHIP and by recording 12 strikeouts in his 13.0 IP. He was a key cog in Puerto Rico’s run to the WBC Finals. Around his WBC games, Burgos made a total of three appearances in Cactus League play, pitching a total of 10.1 innings and throwing a total of 69 pitches. The results don’t make much difference, as they tend not to in Spring Training, but with a healthy rotation at the end of camp and the late addition of Kyle Lohse, Burgos simply wasn’t going to break camp in the rotation last year. Burgos arrived and pitched well in a shorter start against the Chicago Cubs in his debut (5.0 IP, 1 ER) and picked up his first Win. He would make two “quality starts” in the rotation after that. Then, a nightmare. On May 11th, on nine days rest, Burgos was given the ball to start against the Cincinnati Reds. In just 3.0 innings, Burgos was left in the game to throw 88 pitches, allowing 12 runs (10 of them earned) on 11 hits and three walks. He only allowed one home run in all that, if that helps illustrate the pitcher from that day. He was the definition of knocked around. Ron Roenicke was almost forced to stick with Burgos that long as the Brewers bullpen was extremely short that night. There’s no way to know for sure, but in his second start (on regular rest) after the debacle in Cincinnati, he left his start on May 21st against the Los Angeles Dodgers at Miller Park with shoulder stiffness. Roenicke later admitted that Burgos had first reported the shoulder issue following the 88-pitch night at Great American Ballpark. 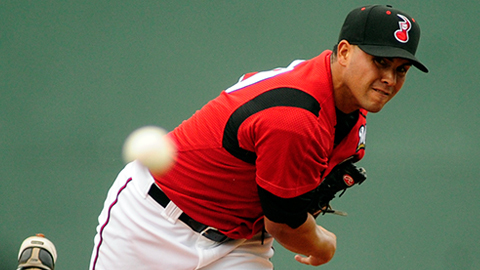 Burgos would make a couple of rehab starts before his activation and immediate optioning to Triple-A Nashville. All told, the man who made 27 starts and pitched in 28 games at three levels of the minor leagues in 2012 would make just 15 total starts in 2013. Hopefully it was just a little bit of karmic balancing in 2013 after his 2012 was such a positive ride. Finishing up this offseason with a stint in winter ball, Burgos once again pitched very well and was named his league’s best pitcher. In a very small sample, Burgos has shown that he’s capable of being a back-of-the-rotation contributor. He won’t get that chance with Milwauke to begin 2014. There were already arguably at least six pitchers ahead of him, and then the Brewers went out and added Matt Garza pushing Burgos back a slot in Nashville’s rotation to begin the year. The now 26-year-old right-hander will certainly get to camp and do the work necessary to be ready to go if something happens like it did in 2013. If there’s one thing that you can count on with Hiram Burgos, it’s that he’s willing to work. And even if he starts the team as the 8th starter, how many teams don’t use that many in a season between injuries, spot starts, and double-headers? In other words, opportunity can always present itself. It’ll be up to Burgos to capitalize the next it does like he has before. The Brewers just announced that LHP Tom Gorzelanny has been reinstated from the 15-day Disabled List in advance of tonight’s series opener against the Pittsburgh Pirates at Miller Park. Gorzelanny was placed on the DL back on May 11th (retroactive to May 8th) with left shoulder tendinitis. He threw live batting practice earlier in the week and was given the green light by the team’s medical staff. The bullpen has performed very well these last two weeks despite their overabundance of innings pitched. That wasn’t because they lost Gorzelanny though. Far from it. When he was placed on the DL, Gorzelanny sported a 2.30 ERA in 15.2 IP across 18 games. His 0.894 WHIP is very, very good and his 177 ERA+ illustrates how much better he’s been than your average pitcher so far. He’s also tallied a Win in relief to go along with six Holds. He did have one Blown Save (against the Cardinals) which came three appearances before his injury was revealed but it likely wasn’t a factor at that time. But there are only 25 spots on a 25-man roster (aptly name, right?) so as with any activation someone has to be moved out. That someone is Hiram Burgos who was placed on the disabled list with a “right shoulder impingement”. The Brewers are technically carrying only seven bullpen arms with Mike Fiers officially being tapped to start on Saturday, but their also carrying a useless body on the active roster as well. Still, they’re already short on the bench so obviously someone had to go from the pitching staff. If Lohse does only miss one start then Fiers can simply remain in the rotation for the time being or they can go get a spot starter for Tuesday. Burgos has a bright future still but his present will benefit from a bit of a reset. That will produce a need for a starter on Tuesday against Minnesota. (Wily Peralta will just go on normal rest on Monday.) Roenicke thinks they’ll fill the start from the current roster which means that it’s likely a “bullpen game”. In that scenario, it makes the most sense to start Alfredo Figaro and fill in thereafter as needed. Kyle Lohse, assuming he can get back to work next week, was originally penciled in for Thursday which is the next day his rotation spot would come up. Chris Narveson likely won’t be ready by then either, for what it’s worth, as he’ll reportedly be sent on rehab before being activated, assuming he’s healthy by then. Following Saturday evening’s victory over the Chicago Cubs, Brewers manager Ron Roenicke was noncommittal at best to his immediate plans for the starting rotation. 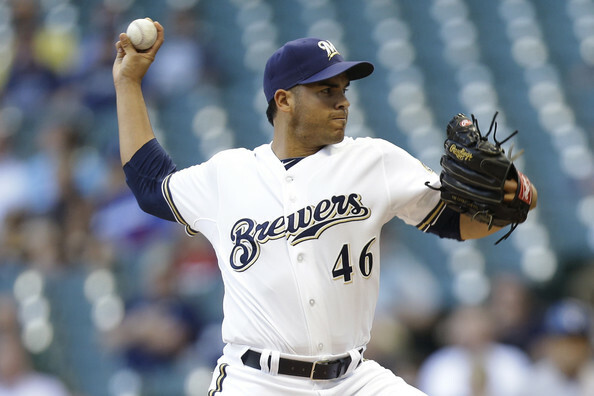 That’s understandable to a degree because while Hiram Burgos pitched very well against the Cubs, the Brewers don’t need a fifth starting pitcher again until next Tuesday, April 30 back home against the Pittsburgh Pirates at Miller Park. We know that both Roenicke and his pitching coach Rick Kranitz prefer to use scheduled off-days as a way to help their starting pitchers get extra rest with the goal of staying healthier and however fresher into the summer. We also know that Yovani Gallardo in particular prefers to pitch on regular rest whenever possible. Though I haven’t the others involved, chances are good that they appreciate routine in kind. Roenicke gets the final call though, and his decision regarding how his rotation will line up over the next couple of weeks does have impact. Obviously, Roenicke realizes this which is why he said that they are considering match-ups and their days off when determining how to proceed. There are two main scenarios to be considered with some variables involved. – Variable 2: Someone else will make that start with Burgos being optioned to minors to stay on schedule and someone filling a bullpen role between now and then. The fallout from Scenario 1, Variable 1 is twofold. First, it means that Lohse and Gallardo will continue to pitch consecutively for now. That’s probably something that Roenicke would have done anyway had Lohse been in camp all spring. Second, Burgos will follow Estrada in turn which could result in similar pitchers back-to-back but basically asks Burgos to pitch over his head in some match-ups. In this, Burgos’ next three opponents are the Dodgers, Pirates, and Rangers. He would be the one SP to miss the Cardinals series at the beginning of May. Gallardo faces the Cardinals in either scenario, for what it’s worth. Variable 2 for Scenario 1 allows the rotation to reorder itself back to how it was coming out of spring. Gallardo, Estrada, Peralta, Lohse, and now Burgos as the fifth SP. Here, Burgos faces the Dodgers and Cardinals for sure. Scenario 2 gives us the following match-ups. Burgos gets Pittsburgh on 4/30, St. Louis on 5/5, and then there are off-days on both sides of the Texas two-step series on May 7 & 8 to negotiate again and determine the value of a fifth starter taking his turn. I’d have to think that Roenicke will skip the fifth starter around the Rangers series because if he simply goes with extra rest, everybody will have six days off between starts instead of the usual four. So there are the scenarios and some of their resultant impact. So I ask you, Brewer Nation, if you were in charge which timeline do you think will produce the best outcome?